It’s been almost a year since UC San Diego and Qualcomm (NASDAQ: QCOM) confirmed an initiative was underway to create an ambitious robotics institute that would include a new incubator for robotics startups. The effort was conceived as a way to put San Diego on the map as an up-and-coming innovation hub in robotics, create inroads for Qualcomm’s wireless technologies, and enable UC San Diego to join the ranks of elite universities already leading the nation in robotics R&D. But it’s hard to measure how far the initiative has progressed since last year’s splash. Both UC San Diego and Qualcomm have maintained radio silence. Among some insiders, though, there are don’t-attribute-this-to-me reports that Qualcomm intends to house the robotics incubator itself, with the curriculum and mentoring services provided by Techstars, the Boulder, CO-based accelerator that already operates a half-dozen accelerator programs on behalf of such companies as Microsoft, Sprint, and Disney. Many details are still being worked out, however, and neither Qualcomm nor Techstars founder David Cohen would comment. Leaders at UC San Diego also declined to say much, although they seem closer to raising the curtain on at least some aspects of their efforts at the Jacobs School of Engineering. For one thing, an international forum on “contextual robotics” to be held at UC San Diego on Oct. 10 includes a veritable Who’s Who of innovation leaders in robotics. 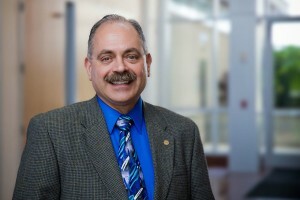 Albert “Al” Pisano, dean of the engineering school, said in a recent interview (our Q&A is below) that the robotics forum “is a key part of our effort to reach out to technologists and thought leaders” as part of the effort to build the new robotics institute and “catalyze” a robotics ecosystem, including manufacturing. The featured speakers include Segway creator Dean Kamen of New Hampshire’s DEKA Research & Development Corp; Gill Pratt, program manager at the Defense Advanced Research Projects Agency (DARPA) who oversees the Robotics Challenge, a $2-million prize competition; Rod Brooks, co-founder, chairman, and CTO of Boston-based Rethink Robotics; Vijay Kumar, a leading roboticist at the University of Pennsylvania who is best known for his work in controlling robot swarms; and Matt Grob, CTO and executive vice president for Qualcomm Technologies, and a key player in Qualcomm’s strategy to develop new markets in robotics. Xconomy: Has UCSD launched its proposed robotics institute yet? Al Pisano: No, not yet. We are in both a listening phase and a capacity-building phase for our future institute for contextual robotics systems. X: What does contextual robotics mean?